When Barack Obama took office as President of the United States, I was struck by his effort to accommodate rivals within his cabinet. Now we have our own cabinet of rivals governing the United Kingdom and the impact on the tone of our politics has been immediate. There are warnings in the press that the unlikely pact between the Liberal Democrats and the Conservatives will end in tears. All governments end in failure at some point. But for now, we have a more adult-to-adult and consensual political discourse and the signs are that the leaders will try their utmost to make it stick. Both David Cameron and Nick Clegg displayed courage and leadership in reaching out to each other. There was self-interest in it, but also a determination to mediate differences so as to establish a majority that can give stable government. Clegg laid the foundation for the partnership the day following the election when – finding he held the balance of power – he exercised moral integrity in asserting the right of the Conservatives to have first shout at forming a government. In doing so, he will have affronted many on the left of his own party who see themselves as more natural allies of Labour. Cameron responded with creativity and lateral thinking when he made his “big, open and comprehensive” offer to the Liberal Democrats to join him in a coalition, identifying areas of common purpose between his party and the Conservatives. He carried his party with him by drawing clear red lines, and not extending too far with his opening position. But he must have known that he would have to compromise much further if he was to close the negotiations successfully. That he was willing to make these further compromises is testimony to his seriousness as a leader. He was prepared to do what was necessary to secure power, knowing that without it his leadership of his party is nothing. In this context, Nick Clegg’s flirtation with the Labour Party before completing the pact with the Tories was a necessary part of the dance. Members of the Conservative Party and its supporters in the press expressed outrage at this “betrayal”. But it was noticeable that Cameron and his lead negotiator, William Hague, were forbearing. In my view, this was the manoeuvre in the negotiations which cemented the marriage and the Conservative leadership recognised this. To carry his party, Nick Clegg needed to gain more from the Conservatives than had been outlined in Cameron’s opening offer and he needed to demonstrate that he’d given the alternative option of a deal with Labour a chance. To carry his party, David Cameron needed a plausible reason for compromising further than many of his supporters would have liked. The prospect of the Liberal Democrats sustaining Labour in office provided that pretext. If there were any lingering suspicions that this is a marriage of convenience, the choreography yesterday was intended comprehensively to dispel them. The parties have agreed ways to allow for the differences that they know will surface between them. But they’ll want to avoid this if possible, so there will be more emphasis on leadership by consensus. And the two leaders implicitly draw upon another aspect in which comparisons with Obama seem relevant: the generational shift which may embed the shift in style. Modern leadership displays a relaxed ease – tolerant and inclusive. Both Cameron and Clegg were keen to show a break with the more sectional politics of the baby boomers. And there was a palpable sense that – of a similar age (and background) – they could do business with each other. Since taking over in 2005, the Tory leader has tried to recast his party as one with which liberal Britons could feel comfortable – modern, tolerant, environmentally aware. That has been an uphill struggle, as the failure to ‘seal the deal’ in last week’s election confirms. Yet at a stroke, Cameron has rammed his point home. How, runs the logic, could anyone dispute the liberal credentials of the new prime minister now? The management theorists Rob Goffee and Gareth Jones argue that what is valued above all else in a leader today is authenticity. The coalition provides David Cameron a totemic opportunity to substantiate his claim to have changed his party. “One of the litmus tests of power relations is who laughs at whom. That’s because laughter serves to elevate the status of the person who manages to elicit laughter, while it reduces the status of the person who does the laughing. During the press conference Clegg made a bold attempt to be amusing when he feigned hurt and pretended to be leaving. Cameron responded with a show of embarrassment, but he didn’t laugh. 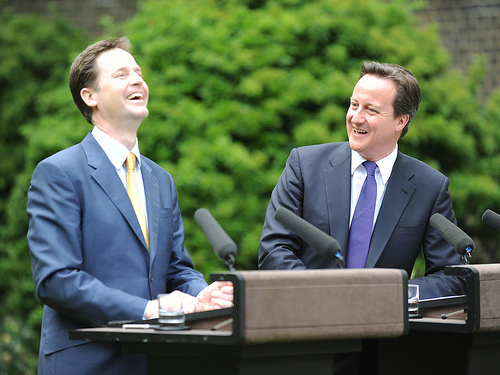 But when Cameron made an amusing remark, Clegg cracked up. On the surface it all looked very jolly, but the underlying purpose of the levity was to sort out their status positions. “The overriding impression that everyone went away with was of two men who are at ease in each other’s company, and who could definitely work together. It may yet end in tears. But, in the meantime, we’ll witness an experiment in more honest and grown-up leadership that may have repercussions beyond politics. This is the second of a pair of blog posts on the leadership lessons of the 2010 General Election. Part 1: Gordon Brown. Image courtesy The Prime Minister’s Office.